The animal we learned about recently is the world’s second largest bird, Emu. Emu can be found in South-Western Australia. Emy belongs to the flightless birds (ratites). Some of the other flightless birds are Rhea of South America, the Cassowary of Norther Australia and Papua New Guinea and Kiwi of New Zealand. 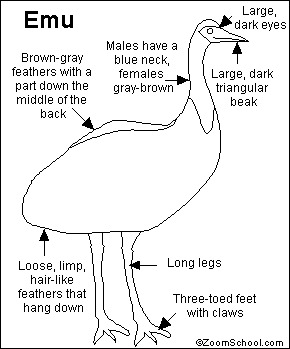 Here is one of the things that we have found over the internet – body parts of an emu. My son so loves learning about the animals, especially those that we do not have locally. It is fun to even search how they actually look like in real life and learn about how they live. I love it as well that I can actually stop awhile and enjoy our new discoveries together, more than researching about the best eye cream for wrinkles that I have to do for articles that I need to post on my beauty blog, homeschooling so refreshes me from my daily grind. tell me more about emu…………. age , feed consuption (age and Grms) eggs laying age, wt of the bird agewise, age details of gr,Lr, feed fomulation.